Pure Water Gazette » Does Organic Cotton Save Water? The word “organic” is a powerful marketing tool. In clothing—just as in fo od—brands love to tout their use of organic agricultural products to show they’re doing their part to fight the industry’s outsized environmental footprint. They know consumers want products they believe are better for them and the planet. “Organic,” which generally means something was grown without synthetic additives or pesticides and wasn’t genetically modified, seems to promise as much. One major reason, as various speakers pointed out at a May 23 panel held by Cotton Inc., a research group that serves the cotton industry, is that conventional cotton varieties have a higher yield, meaning a single plant will produce more fiber than its organic counterpart. That’s because conventional cotton has been genetically engineered for that purpose. In the past 35 years, cotton yields have risen 42%, largely due to biotechnology and better irrigation techniques. 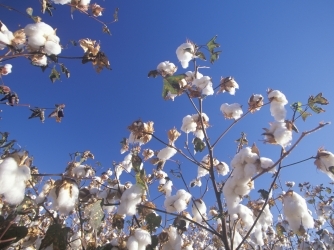 Organic cotton, by definition, comes from plants that have not been genetically modified. Because of that difference, to get the same amount of fiber from an organic crop and a conventional crop, you’ll have to plant more organic plants, which means using more land. That land, of course, has to be tended and irrigated. It will take you about 290 gallons of water to grow enough conventional, high-yield cotton to produce a t-shirt, according to Cotton Inc. To grow the same amount of organic cotton for a t-shirt, however, requires about 660 gallons of water. The disparity is similar for a pair of jeans. Water required to grow organic cotton to make a pair of jeans is 2641 gallons as compared with 1135 gallons for conventional jeans.